France is at a crossroads, writes Jules Hebert, program coordinator at the Heinrich Böll Foundation office in Paris. It can pursue a renewed nuclear model – or follow the German example and invest massively in renewable energy. It is often said that the French people support the nuclear path, notes Hebert – but a recent survey comes to a different conclusion. Article courtesy Energy Transition/Global Energiewende. In November 2017, French Minister Nicolas Hulot announced that the government target of increasing renewable energy in the electricity mix would be postponed, His announcement came as a surprise. He explained that the target of increasing the quota of renewable energy in the electricity mix “will be difficult to maintain”, and that the French government will propose a clear program to reach their postponed targets within a year. The plan to reduce the share of nuclear energy in the electricity mix from 75 to 50% was set out in the energy transition law, which was passed by the previous government in 2015. 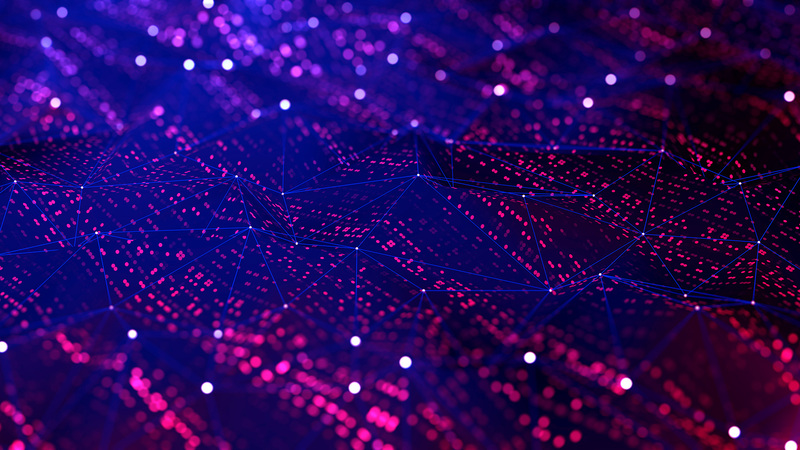 However, it is still lacking a concrete plan, as well as specific steps toward a new energy model – a bit like launching a boat into the water, setting out a course, but forgetting to hoist the sail and pull up the anchor. France is at a crossroads: the government could now choose to invest a lot of public money in a renewed nuclear model. Or it could choose to invest massively in renewable energies. It is often said that the French people strongly support nuclear energy as a jewel of the French industry. However, a survey commissioned by the French office of the Heinrich Boell Foundation and the French think tank La Fabrique écologique, carried out by the research institute Harris Interactive, shows that the French people would rather like to pull up the anchor and set sail for a new model based on renewable energy. Indeed, 91% of interviewees consider the energy transition as “priority issue” (47%) or a “major issue” (44%). 63% see the energy transition as an opportunity rather than as a threat (11%). But what should energy transition look like, according to them? 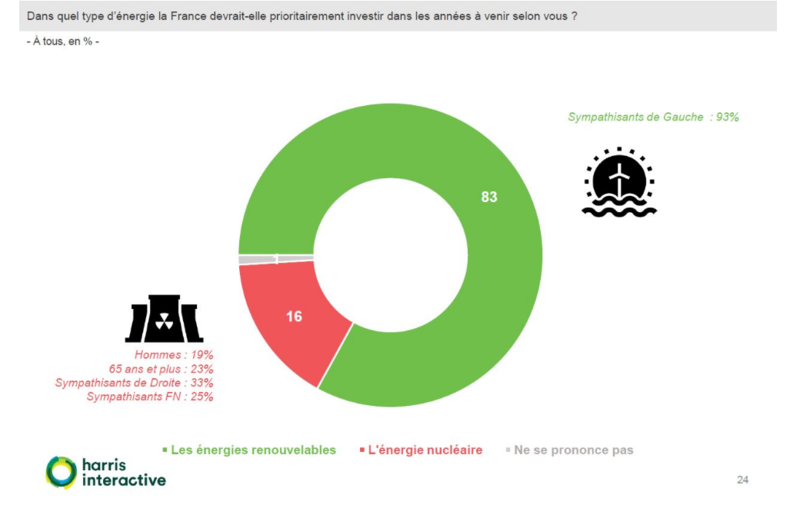 The trend is very clear: 83% of French people think France should prioritize investments in renewable energy. Only 12% of the interviewees prefer that investments go towards the modernization and life extension of nuclear power plants. 66% of respondents come out against the construction of new nuclear power plants. It shows that the advertising and constantly repeated arguments that nuclear energy – often described as “clean energy” – is the only adequate solution when it comes to fighting climate change is not having the intended effect on French public opinion. 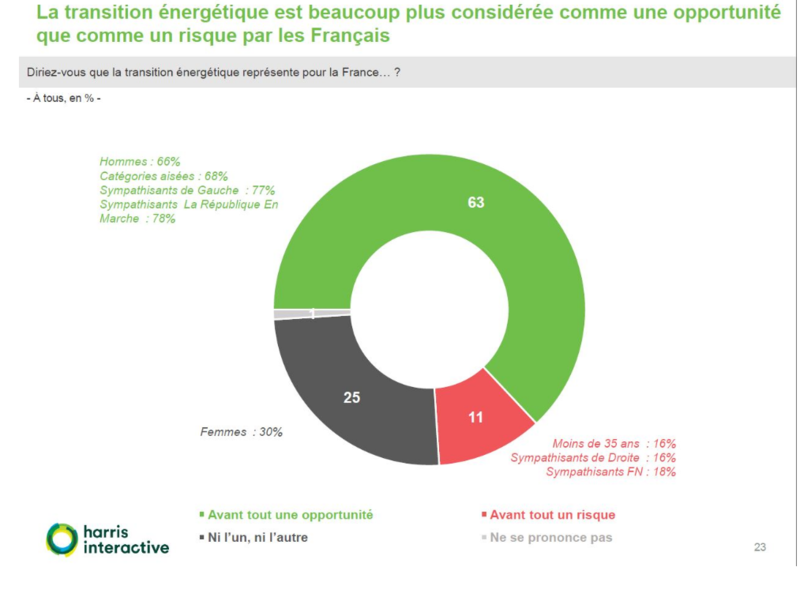 Also surprising is the fact that the actor in which the French people have the most confidence to lead the energy transition is neither the state (trusted by 49% of the interviewees) nor the energy producers and providers like the state owned EDF (trusted by only 46%). Rather, people trust citizen energy cooperatives (trusted by 78%), as well as NGOs and associations (trusted by 66%). Another salient point of the survey is the opinion of the French people about the German energy transition. Respondents perceived the German Energiewende much more positively than their economic and political elites. In the French public debate the German energy transition is often described as a “return to coal” or a financial abyss. The results of the survey by Harris Interactive show that although 72% of the interviewees judge that “the German energy transition has not contributed enough to the reduction of CO2 emissions” (which is true), 65% of them also think that it has contributed to the creation of jobs and to a more dynamic economy. Over half of them see the Energiewende as “a good example for the energy transition.” Last but not least, the French people think France should work more closely with Europe (54%) and with Germany (51%) on energy issues. There are many signs that the wind in France is changing. Earlier this month, the French government launched a ten-point plan that should double wind power capacity by 2023. Furthermore, state-owned energy company EDF (whose market share in France is around 85%) seems to have understood that nuclear energy could not be the only path for the future. The company announced a new plan for solar energy on December 11th, only one day before the One Planet Summit organized in Paris (two years after the Paris Agreement). €25 billion will be invested between 2020 and 2035 to develop 30GW of solar plants in France – four times greater than its current capacity. The next months will show if French President Macron and his Environment Minister Hulot are heading towards a new energy model, based on renewable and decentralized energy production, creating market value and jobs on a local level. This would align with Macron’s ambition to reduce inequalities between rural and urban areas, as well as to encourage small and growing innovative businesses. This article was first published on the website of the Energy Transition/Global Energiewende blog of the Heinrich Böll Foundation and is republished here with permission. The complete results of the survey are available here (in French). Thank Jules for the Post! Germany will likely miss its binding EU target of cutting emissions from sectors not included in the EU’s emission trading system (ETS), and will have to buy emission rights from other countries, according to an internal paper from the German environment ministry, seen by Clean Energy Wire. Figures compiled by Germany’s Federal Environment Agency (UBA) also confirm that emissions rose in 2016, for the second year in a row. Instead I ask for “The winds of realities”. The German households pay about the double for their power – compared to the French. May be, the reason is that high taxation on power will reduce the consumption and thus the need for expensive support for the beloved renewables. Or you may consider the nagging problem about pollution. Here you can get data from 2016. Here more pollution is not the only price. Land shapes and villages are destroyed to get more of the “brown coal”. Germany destroys both land shapes and climate – in order to save it. If you are worried about stable supply of power, also for the future. Also here you better look away from Germany. A new word has entered the language: Dunkelflaute meaning “Dark windless”. Yes, it’s easy to get the general public (most of whom don’t know the difference between a Watt and a Joule) to say anything in a poll, by suitably framing the question. 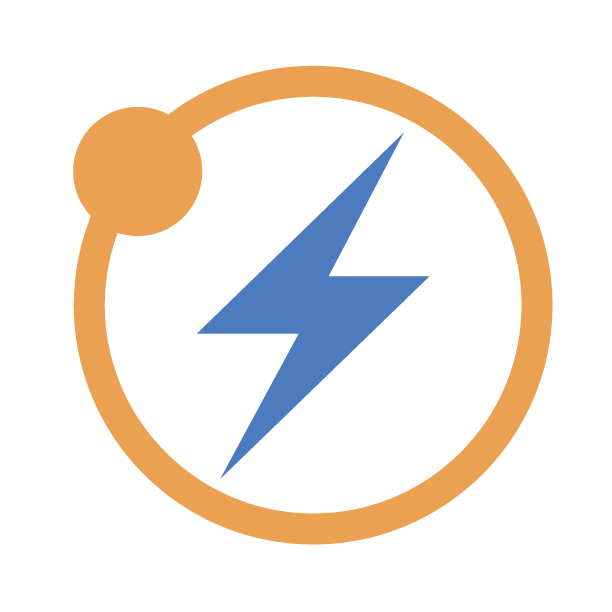 – Continue using the existing fleet of nuclear and hydro, which lead the world in producing the cleanest electricity at competitive prices? – Continue to pay the full cost of the existing nuclear fleet, but curtail one third of its output and add a lot of expensive new pumped hydro storage to make way for variable renewables? – Reduce nuclear fleet output by 1/3, using a mix of wasteful curtailment and expensive decommissioning to make room for renewables, plus add flexible generation from dirty German coal-fired power imports (to the detriment of the environment)? – Reduce nuclear fleet output by 1/3, using a mix of wasteful curtailment and expensive decommissioning to make room for renewables, plus add flexible generation from imported Iranian fossil gas (to the detriment of the environment and energy security)? 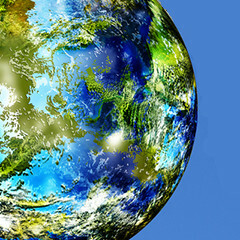 – Reduce nuclear fleet output by 1/3, using a mix of wasteful curtailment and expensive decommissioning to make room for renewables, plus add flexible generation from expensive pumped hydro storage and implement a hydrogen economy (knowing that said hydrogen will cost much more than imported fossil gas and will mean a painful transition for end-users, plus a huge economy-wide hydrogen infrastructure investment)? In fossil fuel dominated grids (e.g. Germany, USA), it is tempting to ignore the dependence on “flexible generation” from fossil fuel in order to support renewables. In the French grid, there will be a huge cost to buy the needed flexibility. The article was published on Dec 19, a little quick to press. On Dec 17, a statement from French President Macon shows he did indeed decide. PARIS (Reuters) – French President Emmanuel Macron said on Sunday he would not follow Germany’s example by phasing out nuclear energy in France because his priority was to cut carbon emissions and shut down polluting coal-fired production. 1. The ‘build subsidized RE’ question in isolation is always going to poll favorable. The (mistaken) notion that someone can power their country from some PV on their roof and a handful of far away wind turbines is appealing. 2. Large reduction in energy use emissions is always going to poll favorable. 3. Affordable energy is always going to poll favorable. It turns out that as a technical matter 1. is in conflict with 2. and 3, and the decision best left to informed representatives of the people to resolve the conflict, as Macron has here. In the French grid, there will be a huge cost to buy the needed flexibility. In Macron’s case, I imagine he was quickly informed that an immediate consequence of accommodating a large RE build would be 1) the construction of new “flexible generation” fossil fuel plants, after France decades ago ended an era of oil based fossil plants, and that 2) French CO2 emissions would inevitably climb a bit. Also, the French coal fleet is now a tiny ~3 GW, one or two facilities. Whereas Merkel had the option of simply keeping her existing coal fleet in place while closing nuclear, Macron would be shouldered with the very visible and hence politically difficult task of building a new gas/coal fleet, pipelines from Russia, coal trains from Germany. These realities would not poll well. Monsieur dit non. Depend on how you define clean energy… And for the prices, it depend a lot on how much what we French call “Grand carenage” (post fukushima works), and future nuclear plants decommissioning, will cost (We could also argue that nuclear were constructed when EDF was a part of the French state, and that the construction costs have lots of bias). That’s not what RTE, French grid operator, says… More or less they say that going 30% renewable is easy, and 50% quite easy. Actually, these last years pumped hydro was less used (and was less profitable), despite the massive development of wind and solar in Europe… Sun shine during daytime, when we are awake, and wind blows mostly during winter, when electricity usage is important. As far as I now, Europe don’t buy Gaz to Iran (in fact Turks are the only ones to buy it). And the European Gaz consumption drops from 2010. The main difficulty in France is to develop new renewable capacity (especially wind ~7 years). In France it makes consensus that 75% of nuclear is way too much, replacing it with new nuclear would make our electricity one of the most costly in the world. That’s the thing about 40 (or 60) year old nuclear plants, you’ve got two choices: either pay $0.5-1/Watt for upgrades and get another 20 years of cheap energy out of them, or pay $1/Watt to decommission them and get nothing. 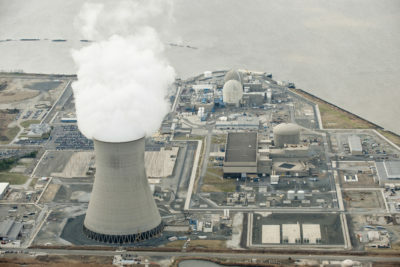 In the US, we close nuclear plants to relieve electricity over-supply conditions which depress wholesale prices, and hurt the profitability of our fossil fuel and renewable fleets; that’s what we mean when we call nuclear uneconomic. This trick will only work in France if they first build up a fossil fuel fleet. Of course it would hurt consumers and the environment, however. By the way, the ADEME study assumes that much of the needed new flexibility will come from German coal fired plants. It is easy to hide that sort of thing in the studies as “imports”. If you are willing to export excess power at zero prices, it can be discarded upon arrival, and you can pretend your imports and exports are balanced.